This week has been so HOT!!!! I swear we have been having July temperatures in the month of June! I have been craving, cold, slushy treats and I can’t get enough watermelon in my diet. My youngest grandson, Cooper, can seriously eat almost a half of watermelon in my sitting, now I understand how he feels. This is a quick and easy treat that will keep you cool and satisfy your sweet tooth. Mix the sugar and water together in a small pan. Cook on a medium heat for about 2 to 3 minutes, or until the sugar is dissolved. Set aside. Pour 4 cups of watermelon into a blender and puree. Squeeze the juice from the fresh limes into the puree and then add the simple syrup to the puree, and mix well. Pour into a 9×9 casserole dish, and cover with aluminum foil. Place into the freezer for 4 hours. Remove from the freezer and then once out, take a fork to loosen it up. You can even put chunks into the blender for a second to make it smooth. Oh man this would of been a nice treat this afternoon. It was warm and humid today in North Texas. Thanks for the recipe looks like something fun for July 4th weekend. this is the best summer treat! can't wait to try this recipe!! I want to make this so badly but I don't think a watermelon will last long enough to make this…lol. My kids LOVE watermelon and can devour a giant one in one day. Thanks for sharing on Merry Monday. This sounds so good as I sit melting in the FL heat. Thanks for linking up to the Bloggers Brags Pinterest Party. I have pinned to the Bloggers Brags Broad. This looks delicious! 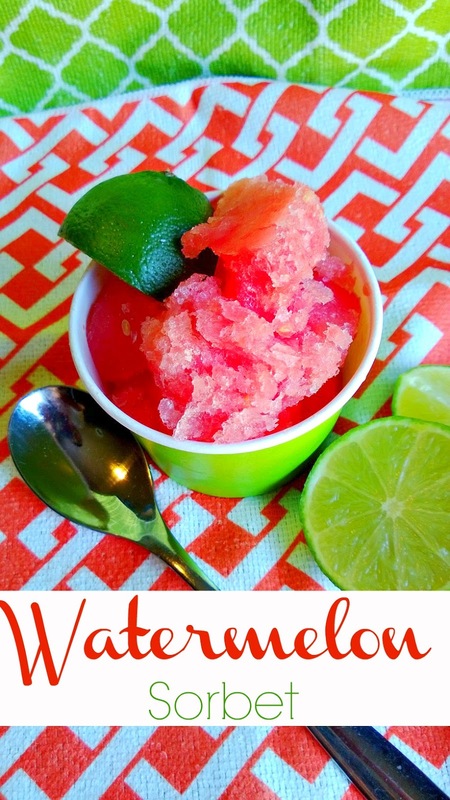 I love Watermelon Italian ice, and this is a much healthier option! Thanks for linking up your great recipe with us at the Best of the Blogosphere. Can't wait to see what you share next week! What a lovely, refreshing dessert – it's perfect for summer! Pinned and will tweet. Thank you for being a part of the Hearth and Soul hop. This sounds delicious, and that photo is so pretty! 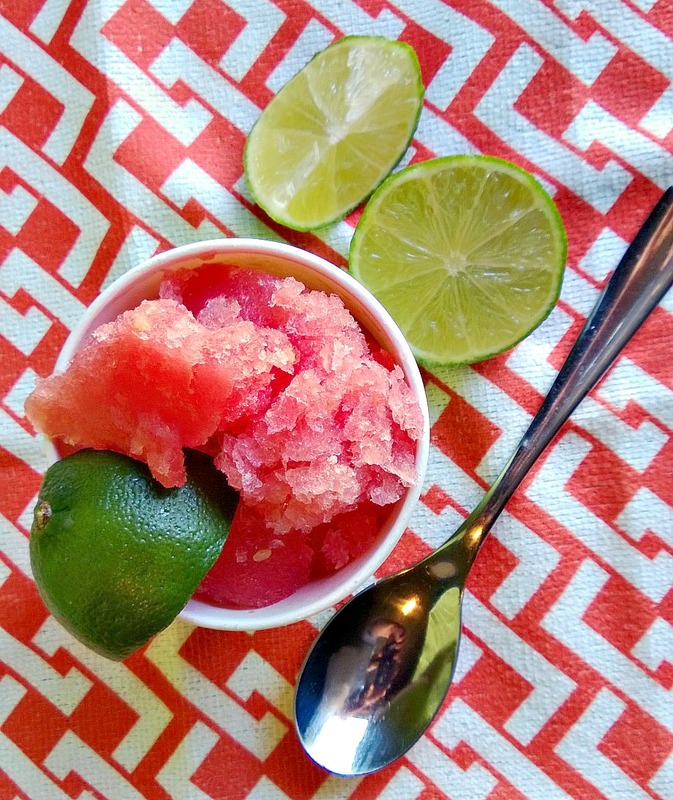 We love watermelon, but I've never thought of making a frozen treat out of it. Pinning to my Recipe board! This sounds so delicious and refreshing! Thanks for sharing at What'd You Do This Weekend? I hope you will join us again this Monday! Oh yum! It's been unseasonably humid around here, so anything to cool us down is welcome. And I happen to have a watermelon in my kitchen calling my name! Thanks for linking with #TwinklyTuesday. How refreshingly delicious! Thank you so much for linking up at Tasty Tuesday! This post has been pinned on the Tasty Tuesday Pinterest board! I love having you and can't wait to see you next week! i think I can eat this!! Must try soon! Thanks for sharing at Home Sweet Home! Anything made with watermelon is fabulous! Thanks for linking up and sharing with us at Funtastic Friday. Hope you join us again this week.